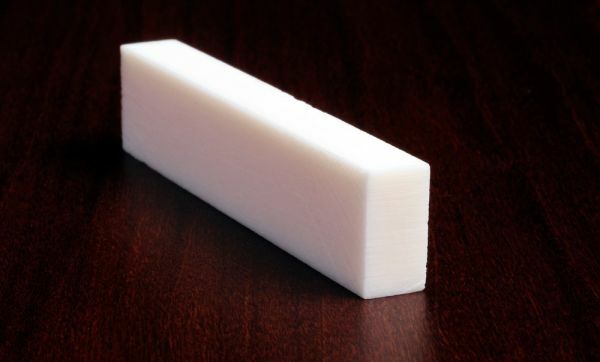 This white bone nut blank will fit all Martin® Style Guitars and almost everything else out there. This is our flagship nut blank and a favorite of many of our customers because it is large enough to fit most every make and model . Many shops simply buy this "one size fits all" nut blank. 1/4" X .470" X 2.2"
Cut heavy on thickness to easily finish at .250 inches. To compliment these parts, ( click here ) to see our selection of Made in USA high quality bone and ivory bridge pins.